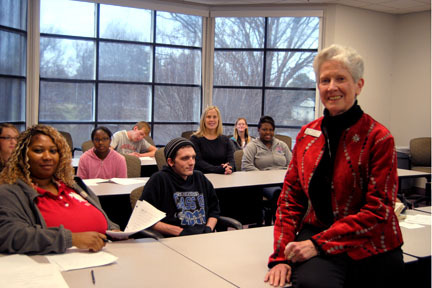 On behalf of the faculty and staff, it is a pleasure for me to welcome you to Dyersburg State Community College. The faculty and staff realize that the main priority is to prepare you for an exciting and rewarding future. We are here to help you set and reach your educational goals, whether you are interested in being ready for work immediately after earning your certificate or associate degree at DSCC or for transfer to a university using a Tennessee Transfer Pathway. Since many of you plan to complete an associate degree, you will be interested to know that, according to recent research, a two-year college graduate can expect to earn at least $350,000 more than a high school graduate over a 40-year career. On average, college students can expect to get back $5.84 for every dollar they invest in a two-year, associate degree. When you consider the economic benefits in addition to the personal, intellectual enrichment that an education imparts, I think that you will agree with me that Dyersburg State is the best choice you can make. We continually hear our alumni complement our faculty and staff for the high quality teaching, advising, and personal attention they received at Dyersburg State. The faculty and staff join me in wishing you a very successful learning experience at Dyersburg State Community College. We look forward to learning and growing with you in the coming semesters.